Mission: Complete your third year requirements and return to Professor Dumbledore outside in the Courtyard. [11.1] Harry, Ron and Hermione walk outside the Castle to the Courtyard and meet the Professors Dumbledore and McGonagall. Ah, glad to see you three survived your final exams. Hermione: Oh, they were great fun! Ron: Speak for yourself. I’ll be having nightmares for months. Well, then. Let’s see whether you’ve completed all of your third year requirements. Now you’ll get a look at the Achievements list. The boxes that are checked indicate completed requirements. 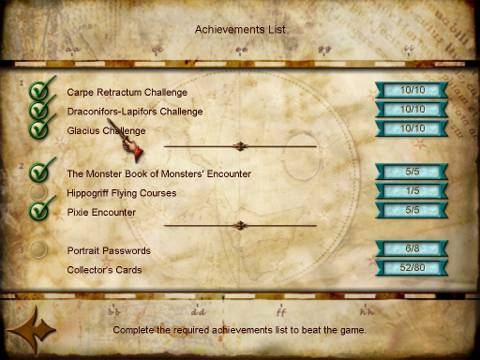 The unchecked boxes don’t and these required achievements need to be completed to beat the game. From the list it seems like we’ll have to fly 4 more courses with the Hippogriff and get 2 more Portrait Passwords from the twins’ shop. We’ll also have to purchase some more Cards from the sellers. Altogether that should complete our Collection of Cards from 52 to 80! Looks like you’ve got a few things to finish up yet. Off you go. Return to the Courtyard and turn left onto the Grounds. Pass the bridge and before entering the Hippogriff course area through the portal (with two red banners bearing Hippogriff images), save by the Book left of it. 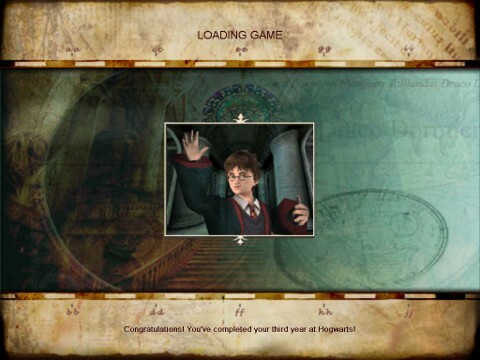 The game will load without a save point and you’ll get a Hippogriff Course Selection screen. Select a course by clicking on a number and then click on Play. Now Bucky comes running in and Hagrid and Harry meet again: Hello, Harry! Back fer some Hippogriff ridin’, are yeh? If it isn’t too much trouble... No trouble at all, Harry! Quidditch Card # 2: Gwenog Jones (1968 – present) – Captain and Beater of only all-female national Quidditch Team, the Holyhead Harpies. Quidditch Card # 3: Cyprian Youdle (1312 – 1357) – Only Quidditch referee ever to be killed during a match. The originator of the curse was never caught but believed to have been a member of the crowd. Quidditch Card # 4: Roderick Plumpton (1889 – 1987) – Seeker for England Quidditch Team. Holds British record for fastest capture of Snitch during game: three and a half seconds. Quidditch Card # 5: Bowman Wright (1492 – 1560) – Famous for developing the Golden Snitch. Harry may return any time to improve his scores. Back on the Grounds go up the stairs to the bridge and traverse the Courtyard into Hogwarts Entrance Hall. There will be a long game load (but no save point). There is that darn Peeves again! Harry: I thought we’d seen the last of you, Peeves! 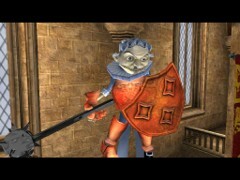 Peeves is wearing armor now. Ron: That armor looks red hot! Oooh, ickle kiddies... Want to play? An autosave is now made. 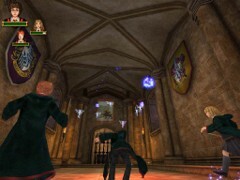 [11.3] Cast triple Rictusempra on Peeves and make sure to strafe when he throws a nasty thing. Peeves will then be stunned for a while. Immediately cast Glacius and he will shed a piece of his glowing armor. Oh, looky, looky! Cracked-Potter has a new spell! That’s not nice! Keep an eye on Peeves’ stamina meter in the upper right corner. After 5 combined blasts Peeves will forever slink off crying (in this game!). Ha! So much for him! Brilliant work, Harry! Thanks... I quite enjoyed it. Hermione has some typical doubts: You don’t think we overdid it... making him cry like that? Ron has also his typical kind of answer: Don’t worry, he’ll be back to annoy us again in no time. Pick up two Cauldron Cakes that Peeves has shed. Now head right, to Hogwarts Side Chamber and save by the Book in there. [11.4] Take Portrait 7 straight up to the 7th floor. Harry hasn’t got enough Cauldron Cakes to buy the last one (Bridget Wenlock Portrait Password at CC 30). A Cauldron Cake costs BB 50. You’d better not spend most of your Bertie Bott’s Beans on that Password, because you may still need some spare Beans for buying Cards from the sellers! So better play it safe now and perhaps we’ll find some more Cauldron Cakes in the Portrait side games! Leave the Shop through the Portrait of the Living Lady and run to the room in front of you. There is the Portrait of Leopoldina Smethwyck. Harry speaks the Magic Password: Polyglottal, and the Portrait opens up giving access to a room. Enter and the game will be loaded (no save point though). Follow the track of Beans all along the stairs into a Library and take a Cauldron Cake! (What did we predict, huh?). Then you will be attacked by a Swarm of Pixies. Strafe and cast Rictusempra to blow them forever away and a Spongify tile will appear on the floor in the middle of the room. The Tapestry on top of the grated alcove will roll up and a load of Beans are thrown on the floor and a track of Beans appear in the air. Spongify the tile and jump up, grabbing all the Beans and land in the opening that was hidden by the Tapestry. Cast Depulso on the wall sign and something happens... but what? 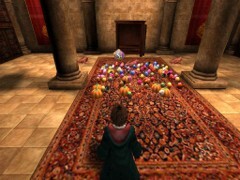 Jump down to find a track of Beans that leads to an entrance under the Hufflepuff banner. Follow the track into a room with 3 Chocolate Frogs and first get all three of your stamina levels full (just eat enough to get fully loaded and spare the other one(s). Cast triple Alohomora on the triple locked chest in there and get an enormous load of Cauldron Cakes, Beans and Pumpkin Pasties! Back in the main room you’ll be attacked by angry books! Cast Depulso to burn them up and a track of Beans is formed to the now open alcove with a triple locked chest. If you’re hurt eat the rest of the Frogs in the next room. Cast triple Alohomora and another full load of Bertie Beans, Cauldron Cakes and Pumpkin Pasties will be spit out, together with your Beast Card # 1: Imp – Found only in Britain and Ireland, the Imp has a slapstick sense of humor and will amuse itself by pushing and tripping the unwary. The game will be loaded without a save point. Save by the Book in the room with the Portrait of the Living Lady. [11.5] Take the stairs on your right to the 6th floor. Enter the room and meet the Portrait of Bridget Wenlock. Hermione says: If we want to see what’s behind this Portrait, we’ll have to buy the Password from Fred and George’s shop. Yes, this was the one we didn’t purchase, right? Let’s play it safe and keep this Portrait for the last. Go to the 5th floor, enter and on your right there is the Portrait of Derwent Shimpling. Harry speaks the Password: Tummy-button. Enter, and after a game load (no save point) follow a track of Beans into a Library where you’ll be attacked by 8 Imps. Push their fire crackers down their throats and in the middle of the room a Chocolate frog will appear. You can cast Depulso thrice on the right Suit of Armor and get some Beans out of that can. Depulso on left can will get a first load of 13 Pumpkin Pasties! A second Depulso will shake out 9 Pasties. There are two Slytherin banners above the tins Suits. Cast Depulso twice on each to get some Beans. The banners will then roll up. Now cast Alohomora on the Tapestry. It will roll up and a Chocolate Frog will appear behind it. Enter your 1st and only Secret Room. Cast Alohomora on the chest and obtain 7 Cauldron Cakes and your Beast Card # 7: Manticore – A rare, dangerous beast, the Manticore has been known to sting softly as it eats its prey. Its sting will kill instantaneously. When returning to the main room cast Depulso on the cauldron for another load of Beans. Get out of here and after a game load (no save point) you’ll be back on the 5th floor. 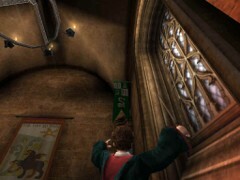 Go down to the 4th floor, go in, ascend the stairs with the green carpet and meet Bertie Bott’s Portrait on your left. Approach the Portrait and Harry speaks the Magic Password: Bibble. Enter a room with Beans and two chests. Cast Alohomora on the table chest and get 14 Pumpkin Pasties and your Beast Card # 6: Giant Squid – the bane of ancient mariners and students at Hogwarts – should the latter decide to go for a dip in the lake. Also a Spongify tile has appeared on the carpet. But first cast Alohomora on the chest on the floor: 13 Pumpkin Pasties and 8 Cauldron Cakes. Wow … this is getting great here! Cast Spongify on the tile, jump up and catch two more Pumpkin Pasties and a Cauldron Cake. Now cast Alohomora on the painting above the table. It will slide up and a Skull will spit out some Beans. Now turn right and notice two chairs. Cast Depulso on each and they will rotate through an angle of 90°. Both chandeliers left and right will shed each 3 Beans. Coming out of this room run straight into a Save Book in the next room. [11.6] Go down to the 3th floor. Go in and check everything but there is no Portrait here. So, descend to the 2nd floor and say hello to your old Gargoyle buddy. Turn left, then right, and opposite of the triple locked chest meet the Portrait of Hesper Starkey. Use the Magic Password Lunartickle to enter this area. Jump in, a game will be loaded (no save point) and enter a room with two Suits of Armor. Look up to higher floors ending with a ledge and a Collector’s Card. Cast Depulso on each tin soldier for the Beans and a Spongify tile will appear in between them on the floor. Spongify and jump up to the second floor. Cast Depulso on the wall sign. A door on either will open and two Imps appear. Fry them and two more come out of the other room. Double fry them and a Spongify tile appears on this floor. First get into that room (on your right?) and cast Alohomora on the chest in there. Get Beans and 9 Pumpkin Pasties. Now take care of the chest in the left room: more Beans but only 4 Pumpkin Pasties (we’re getting spoiled). You’ve already noticed the Fire Crabs on the next floor. Cast Spongify on the tile and get up. Get both Crabs in the hole with Rictusempra and a Spongify tile appears on the floor. On top of that lies a Cauldron Cake and you also get a Chocolate Frog. Spongify, jump up, catch the Cake and land on the ledge seizing Beast Card # 5: Gnome – A common garden pest, the gnome lurks in holes in the ground and may run out and attempt to trip up the unwary traveler. Can be ejected from the garden by swinging in circles and flinging it over the garden wall. Get out of here and after a game load (no save point) save by the book next to the Gargoyle. [11.7] Go down to the 1st floor. Enter and turn right heading for the Portrait of Tilly Toke. Speak the Magic Password: Dirigible and enter. The game will load (no save point) and you’ll all enter a room with a triple locked grated door. Cast triple Alohomora to get access to a Gargoyle. Cast Lumos on the Gargoyle and the left wall will be charmed. Go in there, from the stairs and meet 6 Suits of Armor each with a shield. Cast triple Depulso on each and smash them into thrash. When all six are turned into scrap metal the left wall will retreat revealing a staircase going up to your left. Follow the first part of the stairs and look left: there is that Gargoyle you just charmed! Follow the next part of the stairs and the game will be loaded. You’ll be out of that area again. Apparently there is NOTHING in there? No, no, try again. This time when you’ve sent the tin cans to their recycling plant turn left and find stairs leading down to a room full of Cauldron Cakes you did not notice the first time! There are 12 Cauldron Cakes in there! Go ahead and collect them all. Cast Alohomora on the chest and get a full load of Beans and your Beast Card # 4: Billywig – Has a long thin stinger that causes giddiness followed by levitation. Dried Billywig stingers are used in a variety of potions. Get out of there and on top of the stairs there is a new circle of Beans with 3 Pumpkin Pasties in the middle of them. Get the goodies and take the stairs on your left again to get a game load and get back in the hallway. Save your game by the Book there. 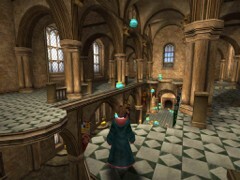 [11.8] Go out of the Great Hall and descend the Monumental Staircase. Enter the Dungeons on your right, and walk straight to the door past the Gargoyle and it will open allowing access to the Dungeons! Now there is a game load without a save point. On your left and right there are locked doors (perhaps the Debug mode later on?). Walk up to the end and notice two Portraits in here. Go to the end and follow the passage on your right to the portrait of Glover Hipworth. Spell (or say?) the Password Gezundheit and enter in there. You’ll have to pass a Save Book. 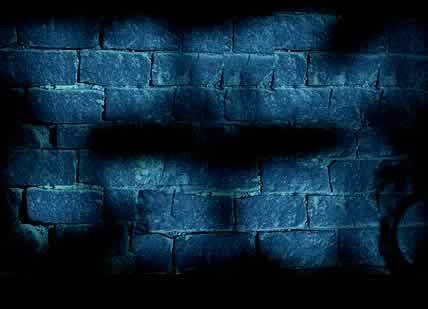 [11.9] Cast Lumos on the Gargoyle in front of you and the wall on your left will be charmed. Proceed until the gap and cast Rictusempra on the Fire Crab until it tumbles into the trap hole at the far end. A track of Pumpkin Pasties will appear. But first backtrack to the charmed wall and cast Alohomora on each chest. The chest on the right (facing the charmed wall) sheds 4 Pumpkin Pasties and the chest on the left a bunch of Beans. Cast again on this one for a new load of Beans. Now turn around and jump on the walkway following that track of Pasties and Beans. Careful now. There is a dark part on that track. Stop here and push those Fire Crabs on your left and right into their holes before going further. More Pasties and Beans will now appear in a straight line after a door will be opened. Further up there is another dark part on the track where you’ll have to push a Fire Crab into a hole on each side. The track will build further on. Follow till the corner and turn left. There are two chests on your right. Cast Alohomora twice on the first one for loads of Beans and on the second one for 4 Cauldron Cakes and your Beast Card # 3: Bowtruckle – A tree-guardian adept at dodging most kinds of charms. May attempt to gouge out your eyes if you approach its tree home in a threatening matter. Go out left and meet Ron and Hermione again. Turn right and now enter the Portrait of Mopsus with the Magic Password Forsooth. Also here you’ll pass a Save Book. [11.10] Go down the stairs and notice a Collectors Card behind a grated door. Turn right and Spongify the tile. That will allow you to cross a deadly gap and land on a ledge with another tile and a chest. Cast Alohomora on the chest twice for Beans. Spongify this tile and land on another similar ledge. Cast Alohomora twice on the chest for each time you will get Beans and 2 Pumpkin Pasties. Spongify and jump to a third such ledge. Alohomora twice on this chest provides a double load of Beans and a Cauldron Cake. Spongify this tile and land on the ledge behind the grated door you saw at the beginning. Catch your Beast Card # 2: Doxie – Sometimes mistaken for a fairy. Nests in bushes and, if approached, will attempt to bite with its double row of sharp, venomous teeth. There are two chests here. Facing the grated door cast Alohomora on the right hand chest and receive a stack of Beans and a bonus of 3 Pixies! Apply your strongest insect repellant. The left hand chest? … 4 of those white nasty fake Dragonflies! After having crushed them pick up the Chocolate Frog. The grated door has gone up but also look left: a track of Cauldron Cakes and Pumpkin Pasties is leading downward. So why not try a jump into the deep following that track first? Run and jump down. You’ll land on the previous ledge again. Spongify the tile, jump up and grab the ones you’ve just missed. Now go out and immediately notice a tile on your left and a track of Pasties in the air. Spongify and follow the track down, grabbing all goodies. You’ll land on one of the previous ledges. Spongify this tile and jump up along another track of goodies. Look left and see another track full of treasures! Spongify, jump up and catch them all! Spongify and bounce up to the ledge where you fought those pesky Pixies. Now go straightforward and exit this area, and meet Ron and Hermione again. Go left, out of the Dungeons and speed straight up to Hogwarts side Room where you save by the Book first. 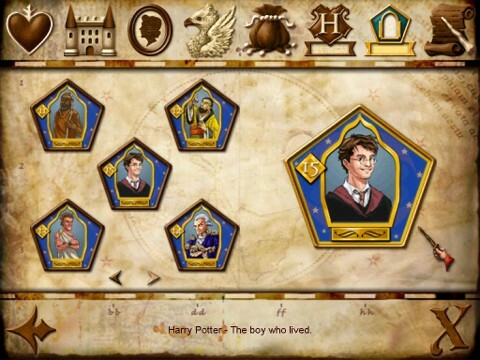 [11.11] Take Portrait 7 up to the Fred and George’s shop and purchase your last Portrait Password. Go to the 6th floor and enter her Portrait with the Magic word Snafflejack. Go in here and again a game load without a save point will be made. Go to the right and enter a tall room with paintings, bookcases and Tapestries. Cast Alohomora on the bookcase on your right and it will retreat revealing a room. Go in there, turn right and cast Depulso on the wall sign. Turn right and observe how a Spongify tile has been set free on the floor. Cast Spongify and jump up into a higher room with a Tapestry and a Suit of Armor. Cast Depulso on the tin man and get 11 Pumpkin Pasties. Next cast Alohomora on the Tapestry and it will roll up. Go inside the passage, turn left and enter a room with a Suit of Armor and a Spongify tile. Cast Depulso on Mr. Tin and get Beans and 5 Pumpkin Pasties. Spongify the Carpet and land in a similar room on the opposite side. Cast Depulso on the suit of Armor for 5 Cauldron Cakes. Spongify the tile and end up in a higher room with a tile and a red Tapestry high up. Spongify this tile and land in a room with a ledge containing a tile. Spongify this tile and end up down below in a Library. Cast Alohomora on the cabinet and all hell breaks lose! You’ll get a Collector’s Card and a pack of angry books. Defeat these books by strafing from left to right and always casting Depulso. When all pages are gone up in flames an enormous pile of beans and Pumpkin Pasties will become your property, as well as 3 Chocolate Frogs. Pick up all these goodies, eat a Frog if needed and collect your final Beast Card # 8: Unicorn – The Unicorn is a shy creature and generally avoids human contact. It is more likely to let a witch come near it than a wizard and casting magic spells may frighten it off. Its blood has highly magical properties. Get straight out of this area and up again to the 7th floor, and save by the book in front of the Portrait of the Living Lady. [11.12] Hear that guy again who is forever calling Harry? PP 70 – Wizard Card # 14: Thaddeus Thurkell (1632 – 1692) – Famous for producing seven Squib sons and turning them all into hedgehogs in disgust. BB 75 – Final Witch Card # 4: Wendelin the Weird (Medieval, dates unknown) – Alleged to have enjoyed being burnt at the stake so much that she allowed herself to be captured forty-seven times in various disguises. PP 40 – Wizard Card # 9: Wilfred Elphick (1112 – 1199) – First Wizard to be gored by an African Erumpent. PP 20 – Wizard Card # 12: Dzou Yen (4th Century B.C.) – Chinese Alchemist. The guy runs off now. And this is the entire set of Collector’s Card you could obtain while playing the game so far – 74 Cards! Time has come for a final visit next door to Fred and George’s shop! Go straight to the side Room and catch your Bonus Collector’s Card # 75 – The final Wizard Card # 15: Harry Potter – The boy who lived. We always find this so touching! Now you will get a visit to the Beans Bonus room without a time limit and may collect anything you can in there! The Beans Bonus room is yours now! Spongify the first tile and jump up along a track of Beans and your Bonus Card # 4: Salazar Slytherin (Medieval, dates unknown - - Co-founder of Hogwarts. Gave his name to one of the four Hogwarts houses. Have a good look around here. On top you see two more Collector’s Cards. Bur first, let’s empty the entire first floor. You can’t open the chests here for now: just follow the tracks of Beans. Meet Bonus Card # 3: Helga Hufflepuff (Medieval, dates unknown) – Co-founder of Hogwarts. Gave her name to one of the four Hogwarts houses. (you’ll find this Card twice!). Once again, the suits of Armor will voluntarily spit our loads of BB, CC and PP. When the whole first floor is “cleaned” of goodies, go up by the Spongify tiles. Grab Bonus Card # 2: Rowena Ravenclaw (Medieval, Dates unknown) – Co-founder of Hogwarts. Gave her name to one of the four Hogwarts houses, and also Bonus Card # 1: Godric Griffindor - (Medieval dates unknown)- Co-founder of Hogwarts. Gave his name to one of the four Hogwarts houses. Have great fun in there and collect everything you can get!! And up on the second floor cast one of the Spongify tiles, jump up along a huge track of Beans catching your final Bonus card # 5: Dumbledore – Headmaster of Hogwarts! When you’ve taken all Beans and Bonus Cards a rain of Cauldron Cakes and Pumpkin Pasties will be your share of the loot! So jump down and get all the goodies you can grasp! Now you’ll notice a Depulso sign on the floor. Cast Depulso and all the chests will open up spitting loads of goodies!! And now you’ve got everything you could have taken here! 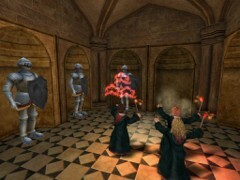 Go out of the bonus Room and the game will be loaded and you’ll end up in the Hogwarts Side Room. There’s a book where you can save. [11.13] Go out of the Castle and meet the Professors Dumbledore and McGonagall left of the Courtyard. Well done, all of you! You’ve completed your third year requirements. Splendid work. Absolutely splendid. You should all be very proud of yourselves. What you did for Sirius Black and Buckbeak was truly courageous. Now, do try and behave yourselves during the summer holidays. The game will be loading offering you congratulations! You’ve completed your third year at Hogwarts! As the Hogwarts Express carried him and his friends back to King’s Cross Station, Harry recalled something Professor Dumbledore had said... You think the dead we have loved ever truly leave us? You think that we don’t recall them more clearly than ever in times of great trouble? Your father is alive in you, Harry, and shows himself most plainly when you have need of him. We now say goodbye to Harry in the train. 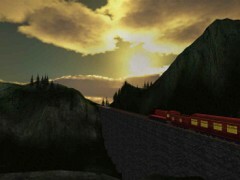 Hogwarts Express is leaving for home!